Hillary Clinton wins South Carolina primary. Hillary Clinton gives a victory speech on February 27, 2016 in Columbia, South Carolina. 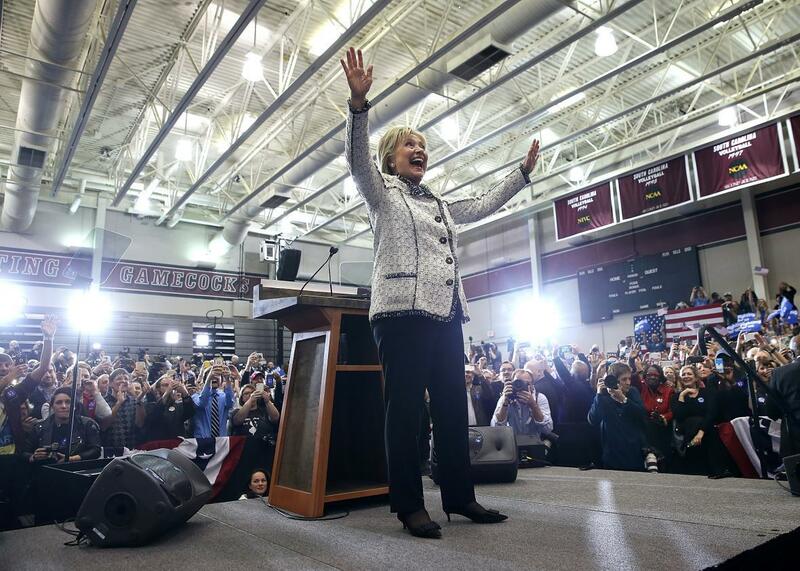 Clinton won the South Carolina primary over Democratic rival U.S. Sen. Bernie Sanders. Hillary Clinton easily defeated Sen. Bernie Sanders in South Carolina, her “Southern firewall” that more than held Saturday. The fourth and final early state ahead of Super Tuesday should begin a drubbing of Sanders that will continue on Tuesday and culminate in Clinton’s nomination in Philadelphia this summer. South Carolina—not Iowa—was where Sen. Barack Obama began the run of wins that built up his insurmountable delegate lead over Clinton in 2008. It appears as if it will serve the same purpose this time around in Clinton’s favor. And in this case, as in 2008, it will be South Carolina’s black Democratic voters who delivered the critical victory. In 2008, 55 percent of South Carolina’s Democratic primary voters were black. Obama, whose 55 percent of the total vote bested Clinton’s 27 percent and John Edwards’ 18, won black voters by a 59-point margin over Clinton. This, you’ll recall, was the lopsided win that Bill Clinton dismissed as insignificant, since Jesse Jackson also won the state in 1984 and 1988. The critical interpretation of these remarks was that Clinton was suggesting Obama was “the black candidate” who couldn’t translate that win into a broader coalition across the map. After the two battled to a Super Tuesday draw—a major moment for Obama, who showed that he could close Clinton’s long-held national polling gap—Obama won 10 consecutive contests across a broad range of demographics over an 11-day period. A factional candidate, he was not. And neither will Hillary Clinton be this time around. The preliminary South Carolina exit polls Saturday show black voters to be an even larger part of the Democratic primary electorate. A full 61 percent of voters were black to 35 percent white this time around. Clinton’s polling lead among South Carolina black Democrats heading into Saturday was 46 percent—71 to 25—according to an Emerson poll taken last week, or 47 percent—68 to 21—according to an NBC/WSJ/Marist poll taken last week. Exit polls on Saturday showed her winning black voters by a full 68 percent, 84 to 16. The strength in Clinton-supporting black voters was reflected in other areas of the exit polls, too. Seventy percent said that the next president should continue Obama’s policies, versus 19 percent who said he or she should switch to more liberal policies. As ABC News writes, “Previous peak support for continuing Obama’s polices was 55 percent in Iowa and 50 percent in Nevada, vs. 40 percent in New Hampshire, where Sanders won on the basis of support from voters seeking a more liberal direction.” Eight-two percent of South Carolina primary voters said it’s more important for the next president to be experienced than an outsider. Clinton’s strength among black voters poises her to easily win some big contests on Tuesday: Virginia, Texas, and Georgia, along with Alabama, Arkansas, and Tennessee. Sanders will win his home state, Vermont, by an astounding margin, while Massachusetts, Colorado, Minnesota, and Oklahoma are less clear. Aside from Vermont, though, Sanders’ potential wins would likely come by smaller margins than Clinton’s wins in the big Southern contests. In proportional allocation, that matters—especially when Texas has more than twice as many delegates as any other contest. The period following his strong Iowa finish and New Hampshire blowout was the critical time for Sanders to introduce himself to the rest of the country as a viable contender and to tear down her extraordinary leads among black voters. He was unable to, and that’s a strong indication that—barring some major outside shock, soon—he never will. Hillary Clinton lost the Democratic nomination in 2008 when she lost black Americans en masse, and if she wins the nomination in 2016, as she’s very much in line to, it will be because she won black Americans en masse. There is no more loyal part of the Democratic base than black voters, especially black women. It’s only fair that they be the demographic to tilt a Democratic presidential nomination one way or another.